Yes, we have dirty, dirty minds now. And of course, you can’t help but laugh at how the fake Eastern European accent only makes you imagine The Count as a addict… not to mention his prancing around. Now really. Is Viagra a medication that should be given out for free? I mean, I’ve been working here for almost 3 months now, and I’ve called in orders for various maintenance drugs (cholesterol, diabetes, blood pressure etc.) which by all means are QUITE necessary. i’ve even done some Hep C and Cancer medications. And available at no cost to those who qualify? Back to work, I’ll discuss this in depth later! Of course, the most biting line of the song is “You’ve wrung me out too too too many times,”where it alludes to the act of cleaning and drying the article… hoping that it remains the same. My take on it is about emotions and feelings… they can be “wrung out” repeatedly. But we all know (thanks to our mothers) that clothes slowly begin to fade. which reminds me… I should proably get to this giant heap that has been taking up half of my floor space here! Which came first? 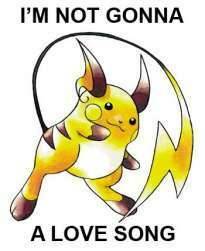 The Pikachu pun, or the Raichu one? Haha. I can’t get enough of these. If anyone can come up with a pun using Bulbasaur I will be thoroughly impressed. Or one with any other ridiculous Pokemon. Josh: Yes, Good Afternoon. May I speak with Female Patient? J: Yes, Ms. Female Patient, just to tell you your meds are here and you can come pick them up whenever you want. FP: OHHH! That’s great! I’ll be sending my *emphatic emphasis* “friend” to get them for me. J: Sure that’s fine, I’ll give your friend a form for you to sign so that they can pick it up for you in the future. J: Heh, thanks, have a good day. Oh the joys of dealing with the lower end of the spectrum in my county! I absolutely HAD to repost this once I saw it. This has to be the most ridiculously funny thing I’ve seen in a long time. Is it embarrassing that I got the pun immediately, or that I can tell you that it is pokemon #26 right off the top of my head, or that i had a holographic card of Raichu? Yes, I’m a nerd. And I miss the Pokemon days of old!